As a consumer who happens to be a cyclist, I often hear/see/read about products online, in magazines, or another cyclist has an item that catches my eye. During this year's Tour of the Gila, held annually in Silver City, NM, I happened to be in Tyrone, NM, during the Time Trial leg of the Tour. A friend, Karl Frisch, is a professional wrench and lives down the street from me in Silver City. He was working for SRAM during this year's Tour. The energy of the event is palpable...and the BIKES! Whoa! My credit cards were weeping. A LOT of money in bikes there! While talking with Karl, I overheard a guy, who was riding a Lynskey bike (yes, we cyclists notice these things...sort of like women noticing other women's clothes), talking to one of the other SRAM wrenches. He mentioned that he worked at REI and had this cool, compact, bike tool that a guy he knew was making. Well, something along those lines. Made a mental note of what he said: Fix It Stick. 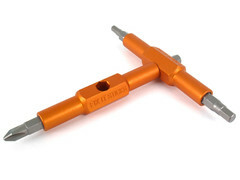 This Fix It Stick compact bicycle tool gets a "5 Star" rating from me. I don't get paid to review bike products, or any other product. Nor do I get free product to do a review. Even if I did, I'd still review it as I see it. Those who review products for money and/or for free product and always say good things about the product are worthless, at best, and dishonest, at worst, maybe more. Yes, someone can like a product and someone else may not. I get that. Ok, not going down THAT road. It leads to hell. So, Fix It Stick. A few days after the Time Trial, I searched for Fix It Sticks. Still wasn't sure if it warranted the exemplary commentary the Lynskey bike rider/REI worker said about it, but, what the hell, take a chance! I ordered one...the one with replaceable bits. $36 bucks. Fair price in the scheme of things. It was still in production and shipping would be by June/2014. I got mine a bit early. And I was immediately impressed with the solid build of the Fix It Stick. No slouch materials or crap from China. I ran it through some basics and I liked it. When Eileen decided she was going to start riding her bike again as adjunct training to her running, some adjustments needed to be done to her Surly Long Haul Trucker. Headed to the shed for my full sized tools, but stopped in my tracks and thought, hey, let's give the Fix It Stick a tryout. Better to do it at home than on the road, IMHO. This Fix It Stick rocks, my friends. Rocks! It's sturdy, made of very durable, quality materials, and feels sturdy in my hands. 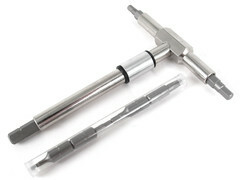 It can be used as a T-style wrench or an L-style wrench with just a simple move of one part. It gets into those places that can be troublesome and provide leverage frequently missing with some of the other "all in one" bike tools. Was it worth the $36 bucks? Damn right! I liked it so much that I immediately ordered one for my nephew and sent it off to him. Told him to send it back to me if he didn't like it and I'd put it in Eileen's bike bag. Brian Davis is the brains behind this tool. Sent him an e-mail telling him how much I liked the Fix It Stick and that I was sending one off to my nephew. He liked that. It looks like the price is $35.99 including shipping. In my opinion, well worth it. It is, hands down, the best bike tool I've seen in my "career" as a bike rider. I replaced the tools that I was carrying in my seat bag with this one tool. It comes in a carrying case made from a tube. For most riders, only a few tools are necessary when riding around where they live. Touring cyclists, however, have a greater need for more tools, just in case, to work on things that come up and home is not nearby nor a bike shop. 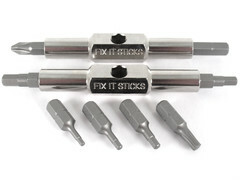 The Fix It Stick allows me to have several of the tools that I need as a touring cyclist in one small package. I can bring other tools and fit them all into one bag in my pannier. 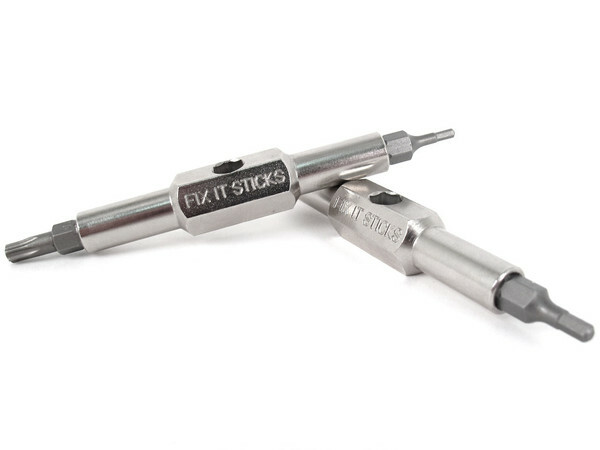 Your experience may be different, but, if you're looking for a compact bicycle tool that really works, I think you'll like this Fix It Stick. You won't regret having one in your seat bag...just in case. A tune to exit this post with...The Temptations doing, "My Girl". Way too many memories with this tune. I was trying to learn how to dance about this time and some guys I met in college were teaching me. Too, too funny. Enjoy...I still love this one.